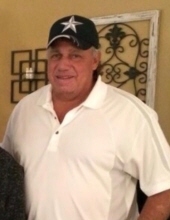 Clifton Joshua Bell, 65, passed away Friday, March 22, 2019 in Abilene, surrounded by his family. Funeral services will be held at 3:00 p.m. Sunday, March 24, 2019, at Kinney-Underwood Funeral Chapel with Pastor Matthew Breeden officiating. Interment will follow in Highland Memorial Cemetery under the direction of Kinney-Underwood Funeral Home. Visitation will be held at 2:00 p.m. Sunday, March 24, 2019, at the funeral home before service time. Clifton was born July 18, 1953 in Stamford, Texas, the son of the late A.J. Bell and Bobbie Bell Nieto. Clifton was retired from the oilfield and was currently living in the Austin area. Clifton was known by everyone to be a very generous man. He loved his family and enjoyed joking around with his nieces and nephews, giving them all a nickname. Clifton was a Baptist. Clifton was preceded in death by his parents; his step-dad, Jack Nieto; a son, Phillip Bell; and two brothers, Aaron Bell and Milton Bell. Loving family surviving Clifton is a son, Eric Bell and wife Amanda of Hamlin; a daughter, Jessica Yearian and husband Robert of Abilene; three grandchildren; brother, Harley Bell of Stamford; three sisters, Emily McNair and husband Larry of Jonesboro, Arkansas, Shirley Breeden and husband Jackie of Abilene, Nancy Henthorne and husband Ken of Lockhart; and many nieces and nephews. To send flowers or a remembrance gift to the family of Clifton Joshua Bell, please visit our Tribute Store. "Email Address" would like to share the life celebration of Clifton Joshua Bell. Click on the "link" to go to share a favorite memory or leave a condolence message for the family.